New Delhi, Oct 30 (IANS) India and Italy on Monday resolved to fight terrorism and cooperate in the area of cyber security in delegation-level talks headed by Indian Prime Minister Narendra Modi and his Italian counterpart Paolo Gentiloni here. “The two leaders resolved to fight terrorism and violent extremism in all their forms and manifestations,” a joint statement issued after the talks said. “They condemned in the strongest possible terms recent terror attacks in India, in Europe and elsewhere and emphasised the need for strengthening international partnership and concerted action by the international community in addressing the menace of terrorism,” it stated. 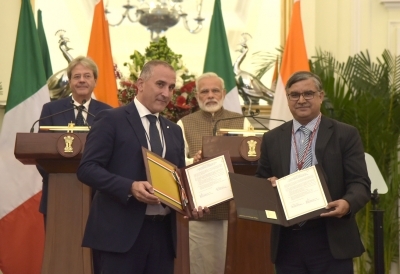 Both leaders also expressed satisfaction on the first India-Italy Joint Working Group on Combating International Terrorism held in Rome in November last year and agreed to further strengthen the consultation mechanism through regular exchange of assessments and information, training and capacity building programme among others in the sphere of counter-terrorism. They agreed to strengthen cooperation to take decisive and concerted actions against Al Qaeda, Islamic State and their affiliates and all other all UN designated globally proscribed terrorists and terror entities. Modi and Gentiloni emphasised the need for effective implementation of existing international commitments on countering terrorism including UN Global Countering Terrorism Strategy, UN Security Council resolutions and targeted sanctions relating to terrorism. “In this context, the leaders also called upon all UN member countries to designate terrorist entities in line with the relevant UNSC Resolutions,” the statement said. In a veiled reference to Pakistan, the two leaders “called upon all countries to work towards rooting out terrorist safe havens and their infrastructure and networks and halting cross-border movement of terrorists. “Emphasising that the liberal and pluralistic values of both countries are rooted in our secular democracy, the leaders affirmed that terrorism should not be associated with any particular religion, nationality, civilisation, creed or ethnic group,” the statement said. In the area of cyber security, both leaders reaffirmed their commitment to an open, free, secure, stable, peaceful and accessible cyberspace, enabling economic growth and innovation. “In particular, they reaffirmed that international law is applicable in cyberspace and that there was a need to continue and deepen deliberations on the applicability of international law to cyberspace and set norms of responsible behaviour of States,” the statement said. According to the joint statement, the two sides also reaffirmed their commitment to strengthening global non-proliferation efforts. “Italy congratulated India on its admission to the Missile Technology Control Regime (MTCR),” it stated. Modi and Gentiloni agreed to work bilaterally and with partners in the framework of UN, the G20 and other multilateral fora to address emerging challenges to international security, global economic stability and sustainable development. “Both sides reaffirmed their support to the new United Nations reform agenda on the three reform tracks of peace and security, development and management reform,” the statement said.